Summary : This old-school no frills foccacia store is a San Francisco institution. An order of their pizza flavored bread will leave you full and satisfied. Liguria Bakery (1700 Stockton Street) has been operating for over 100 years on the northeast corner of San Francisco’s Washington Square Park. Is it a bakery? Well, technically. A pizza place? Not quite. But what is pizza anyway? Loosely define it’s cheese and sauce on bread. But what if you call it flatbread? Or foccacia? The latter is what Liguria Bakery specializes in. Not only that, but the most popular of their ten flavors is their pizza flavored foccacia. Their foccacia is so delicious that it’s usually sold out by 11AM. And in fact when I arrive there on a Saturday morning in late May, they only had one flavor left: pizza. It must have been fate. 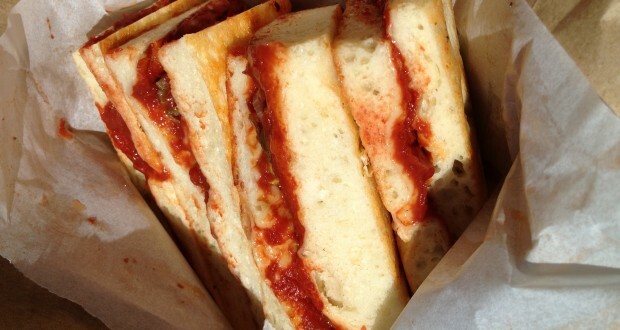 A $5.00 order will get you what I can only describe as a substantial serving foccacia — eight strips of fluffy, chewy bread topped with a flavorful red sauce that would go great on any pizza. It’s served in a brown bag and gets messy — napkins are a must. I managed to finish off all of it, but it was definitely pushing my capacity, especially so early in the morning. Many online reviewers cite Liguira as serving the best foccacia they’ve ever had. While I won’t go so far as to say I completely agree, it’s hard to recall a more delicious and satisfying foccacia experience. It’s a San Francisco institution and a must-visit for a quick morning “snack” if you are ever in the area and can make it there before they run out.